The Sea Venturer programme offers exciting, real life, hands-on experiences for youth. Sea Venturers learn to nurture an active, healthy lifestyle, acquire the knowledge and skills for career development and participate in thrilling outdoor adventures. Weekend events, extended hikes, no-trace camping, group projects and more round out the Venturer Scout experience. Regular weekly meetings take place Tuesday evenings at 7 p.m. 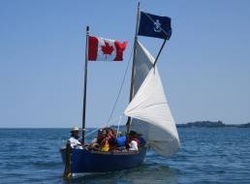 The 65th Toronto Sea Venturers completed an important milestone in 2011. They worked together on completing a "mast derrick" for demonstrations at naval re-enactments of events that occurred during the great age of sail. They demonstrated their creation at the 2011 Roncesvalles Polish Festival, at the Celebrate Barrie Festival and at the Nine Mile Portage War of 1812 historical re-enactment at Fort Willow. The 65th Toronto Sea Venturers have also been hard at work repairing and readying for service, the United, the 65th's retired naval Montagu Whaler. They'll be sailing United to the Tall Ships Festival at Fort George in July 2012 and taking part in War of 1812 re-enactments there, along with the 65th Toronto Sea Scouts. 65th Toronto Sea Venturers along with Sailing Master Hunter at the Fort Willow naval re-enactment. The mast derrick (on right) at Fort Willow in September 2011.